On October 5, 2007 I had my knee surgery. Two years later, looking back, all I can say is what a huge improvement. I spent a year with that achy knee. I was limping around and always really sore. 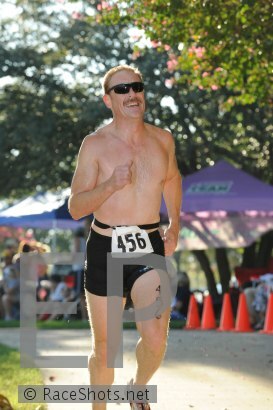 For the last two years - no problems training, no soreness, no limping, and some pretty good race results. I had hoped to compete in this race before the end of the season. As the state championship it was worth some bonus points in the SMW Rankings. This race features a 750 Meter Pond Swim - which plays to my strengths. Unfortunately my boss had me on standby for travel on Sunday, and as such I was not sure if I was going to be able to do the race. Late in the week I got the OK for the race, and I signed up on Thursday night. The weather was really nice race morning. After getting transition set up, I did a two mile run for a warm-up. 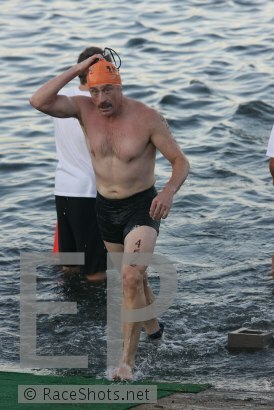 I was in the fourth wave for the swim, so it was a bit of a wait until it was time to go. The water seemed a bit colder than last year - but very nice nonetheless. I lined up on the far inside of the race course. I had clear swimming from the start. However as I was approaching the first buoy I was too far on the inside. And there was some guy next to me who was not correcting his swim and he was blocking my path. So I let him go by and then I took the correct line and by the way blocked him! I am not sure but I think I swam too far on the outside between the first and second buoys. Once we made the last turn we were heading straight into the sun. You could not see the finish or the last buoy. I sighted along the shore and pushed what I thought was much harder than last year. However, coming into the finish I was sighting alot even though I could not see anything. My swim time was 13:11, I did not know it at the time, but I was third out of the water in my wave. Third out of the water. 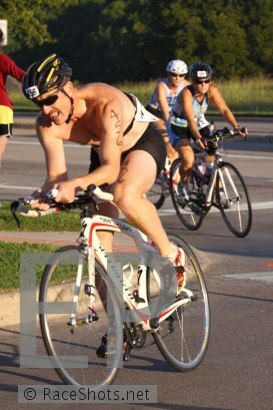 My transition to the bike was uneventful - always good! The bike starts up hill and that is always challenging coming off the swim. My quads were screaming. But - I settled down pretty quickly and was riding strong and hard. By the end of the first loop two masters had passed me but these guys were both in sight. On the second loop another master got by me right at the end of the bike. Just like the bike, the run climbs the same hill right off the start. Right off the bat I got the first master. Before the turnaround I got two more. I passed the last master sometime in the last mile. None of these guys gave much struggle. He, he! First Master after the run. I thought that this was a pretty strong race, but relative to last year it was slower. Regardless you can't argue too much with first overall master!